As you know, the AC technology is the latest trend in the networking realm and it has been slowly, but steady, implemented with every WiFi capable device, in order to replace the older, but more commonly found N-technology. 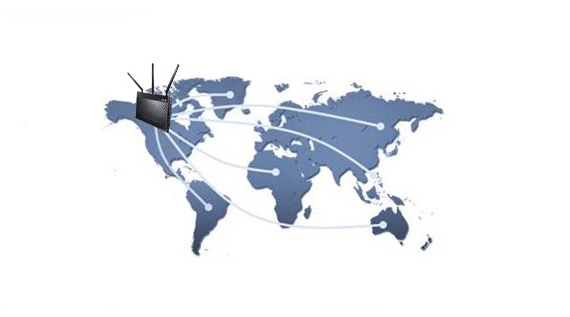 Routers that support the 802.11n technology, usually operate using the 2.4GHz radio band and you would be able to get a maximum of 450 Mbps. 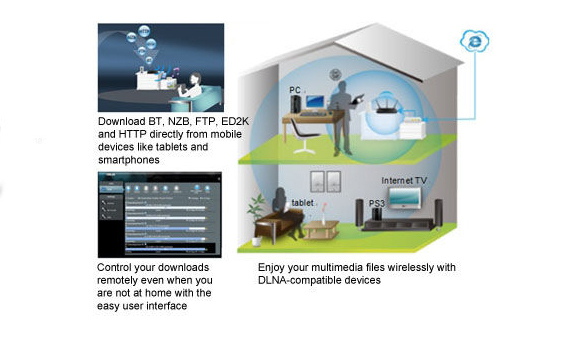 This isn’t bad at all, as most of the time, you won’t need more, but there is a problem, as while 7 years ago, you would have two laptops connected to the WiFi, nowadays, even your fridge has a WiFi card built-in (therefore, a lot more clients!). Also, technology advances a lot and so do routers and WiFi compatible devices (although the latter at a slower rate), so if you want to take advantage of the latest improvements and have better throughput speeds (using less crowded channels) you definitely need an AC router. 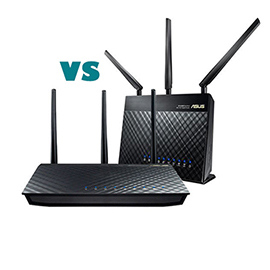 That being said, there are hundreds to choose from, but there are some brands that stand out (like Netgear, ASUS, TP-Link and Linksys) and today we’re going to take a look at two very popular routers from ASUS and see which one is better, the ASUS RT-AC68U or RT-AC66U. 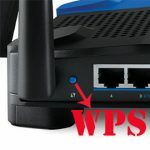 If you don’t know much about ASUS, know that it’s responsible for creating some of the best routers on the market and both the ASUS RT-AC66U and its successor, the RT-AC68U are considered to be classics in the networking world, and this isn’t an easy feat to pull off, especially with such a fierce competition. 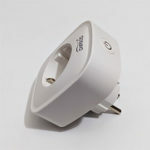 The RT-AC68U does offer some additional qualities when compared to the RT-AC66U, but depending on your requirements you may or may not have a need for them. So, let’s have a look if it’s worth ditching the now aged ASUS RT-AC66U in favour of the newer ASUS RT-AC68U. Although the RT-AC68U is the successor of RT-AC66U, there aren’t some major differences in term of design, the RT-AC68U looking almost identical to the RT-N66U. 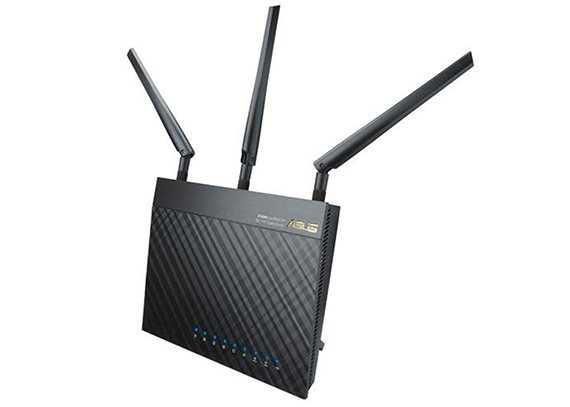 So, ASUS RT-AC66U features a stylish exterior, with a carbon fibre feel and covered with diamond-like pattern (it doesn’t retain fingerprints, unlike other routers with a glossy finish). If it weren’t for the three antennas that pop up from the back, you would easily mistake it for a jewelry box. The RT-AC68U follows the same pattern, although it feels a lot bolder. You get the same sharp design and the diamond pattern on the top, the main difference being the non-detachable base. While the ASUS RT-AC66U could be placed both flat and in a semi-vertical position (or mounted on the wall – VESA compatible), especially because of its detachable base, the RT-AC68U can only be positioned upwards (even the wall-mounting option is gone). It’s not like the RT-AC66U felt more fragile, but the RT-AC68U seems to be a lot more durable and, although positioned vertically, it doesn’t look like it would easily be swiped off the table. The reasoning behind this choice is somewhat understandable, as it will occupy less space than it would, if it stood flat on the table, but it took away the possibility of choosing (that was present in the previous instalment) and this is a minus from our point of view. Anyway, we liked the minimalistic approach of both routers, looking less like a transformer-bot ready to conquer your living room and more like an elegant object that could complement the overall feel of your home. In terms of dimensions, the RT-AC66U measures 6.0×8.0×1.4 inches and weighs 22.4 ounces. 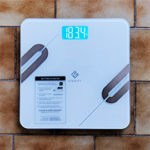 The RT-AC68U measures 6.3×8.6×3.3 inches and weighs the same 22.4 ounces. 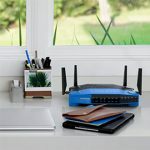 It’s clear that the RT-AC68U is a bit larger, but not by much, because at first glance, you won’t notice a big difference between the two routers. 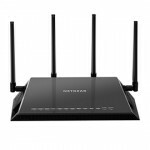 Both the RT-AC68U and the RT-AC66U have three detachable antennas each, that influence a lot to the way the routers are perceived (it adds to an ominous look, especially when the router is positioned upwards). On top of the RT-AC66U there is an array of status LED lights for Power, for the four LAN ports, one WAN port, the 2.4GHZ/5GHz radios and USB 2.0. The RT-AC68U status lights are positioned in the same place and are pretty much the same, except for the additional status LED for the USB 3.0. 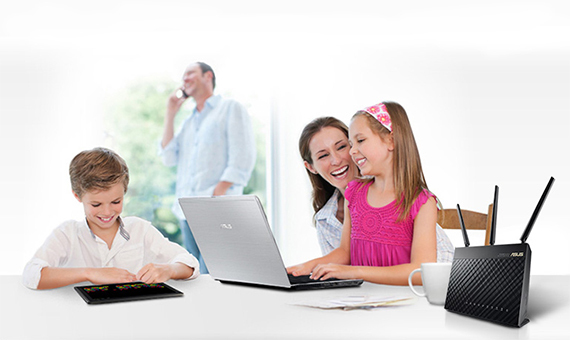 In order to keep the clean look, ASUS has moved all the RT-AC66U’s ports and buttons on the back. So, we got four GIGABIT ports, two USB 2.0 ports, a WPS button, the Power button, a Power Port, a WAN port and the Reset button. 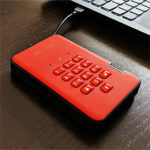 The RT-AC68U isn’t so strict on the positioning, you get a WPS and a WiFi ON/OFF button on the right side (if looked from the front) and on the rear, rests the Power button, the Power Port, a USB 3.0 and a USB 2.0 port, a WAN port, LED ON/OFF (a way to turn off the LED lights if they annoy you), four LAN ports and a Reset button (on the vent grilles). We can’t really pick a favourite since both routers look quite similar, but, overall, the ASUS RT-AC68U doesn’t add much over the RT-AC66U in terms of design – just a USB 3.0 port – and it actually takes away some of its functionality. 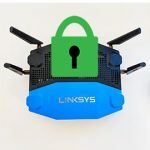 While the design won’t matter too much when talking about routers, what’s inside the case will make a huge difference. The ASUS RT-AC66U introduced us to a single-core Broadcom BCM4706 chipset (600 MHz), a Broadcom BCM53125 switch, 256 MB of RAM and 128 MB storage memory. Furthermore, the RT-AC66U has a Broadcom BCM4331 radio SoC for the 2.4 GHz band and a Broadcom BCM4360 radio SoC for the 5GHz band. Additionally, the 5GHz radio SoC comes with the Skyworks SE5003L 23dBm Power Amplifier. 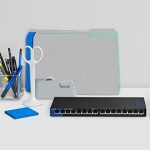 This hardware translates into maximum Ethernet speeds of 450Mbps using the 2.4GHz radio band and up to 1.3 Gbps using the 5GHz band (adding up to the advertised AC1750). If you still wonder about keeping the ASUS RT-N66U, this is the best reason to go for the RT-AC66U, as you get better speeds, the less crowded 5GHz band and the newer (and increasingly popular) AC technology. 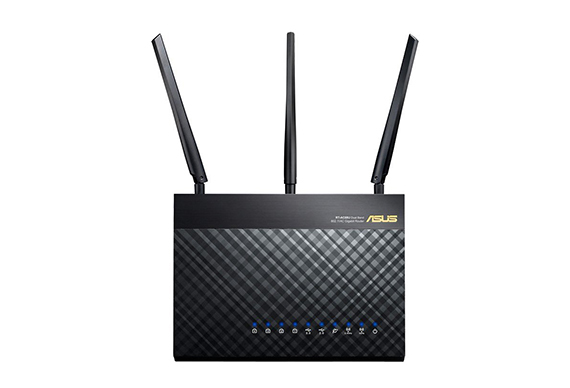 The ASUS RT-AC68U, on the other hand, is a lot better equipped, featuring a dual-core Broadcom BCM4709 chipset (800MHz ARM Cortex A9), 256MB DDR RAM and 128 MB flash memory. Furthermore, the RT-AC68U has a Broadcom BCM4360 (3×3 MIMO) SoC for the 5GHz radio band and a Broadcom BCM4360 (3×3 MIMO) SoC for the 2.4GHz radio band. The RT-AC68U delivers a maximum speed of 600 Mbps on the 2.4GHz radio band and no more than 1300Mbps on the 5GHz band. Sure, the combined 1900 Mbps is nice and all, but that’s not all the RT-AC68U has to offer. Thanks to the BCM4709 chipset, you get the TurboQAM technology, which makes sure that each 2.4GHz spatial stream gets a bump in speed from the common 150Mbps to 200Mbps. Besides this, it’s always better to have a dual-core CPU than a single-core, as it will affect the overall performance (for example, the RT-AC66U will hit bottleneck at 100Mbps with QoS and it will come in handy if you use VPN, where it will make a huge difference). So, the more powerful, the better. 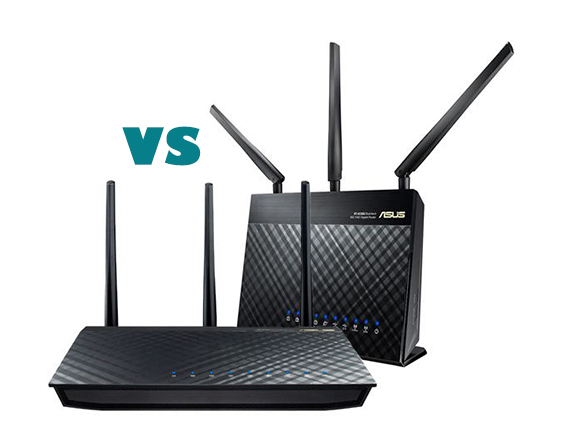 We have actually tested the ASUS RT-AC68U before, when put it against its main competitor, the Netgear Nighthawk AC1900 and it did great (it’s the speediest AC1900 router we have tested so far). The way we tested it was to add another RT-AC68U and connect them in bridge mode. 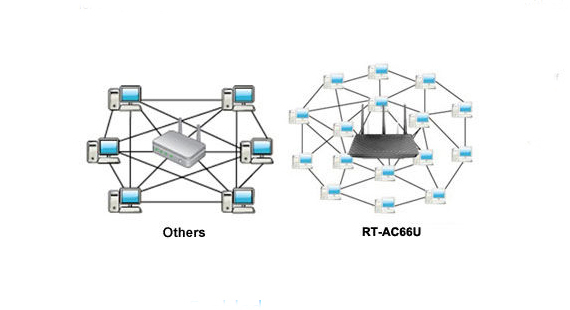 The same principle will be applied for its predecessor, the RT-AC66U (this one is also considered one of the best performing routers in the world). Testing the ASUS RT-AC66U using the 2.4GHz radio band (802.11n) at 15 feet, we got 134 Mbps and at 100 feet, the router scored around 65Mbps. Using the 5GHz radio band (802.11ac standard), we measured a maximum of 345 Mbps at close range (15 feet) and no more than 180 Mbps at long range (approximately 100 feet). The RT-AC66U also offers some decent storage performance. We connected an exterior storage device and we got 84 Mbps for writing and 52Mbps for reading. The RT-AC68U did a lot better (as expected). We measured a maximum of 518 Mbps at 15 feet, using the 5GHz band (and the 802.11ac technology) and up to 330Mbps at a longer distance (100 feet). Using the older 2.4GHz band, the RT-AC68U delivered 205 Mbps at 15 feet and a maximum of 170 Mbps at 100 feet. 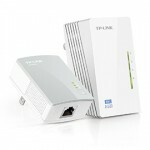 Coupled with an external HDD, the router managed up to 80Mbps for reading and a maximum of 120 Mbps for writing. The results are clear, but there is so much more the RT-AC68U offers. You get the built-in 3×3 MIMO (multiple-input and multiple-output) technology and the ASUS AiRadar TX Beamforming, which should focus the router signal and sending it directly to your clients in a straight line, minimizing the interferences and increasing the signal strength. Both of these features will be better suited for the AC-compatible devices. ASUS is known for its clean, stylish and overall easy-to-use interface and even though the RT-AC66U isn’t a new router, you can still tell apart the high-quality interface (from its competitors) and trace the roots of one of the best router UI ever made. The RT-AC66U’s interface is well organized and it is divided into three sections: the Setup Wizard, the General Settings and the Advanced Settings. 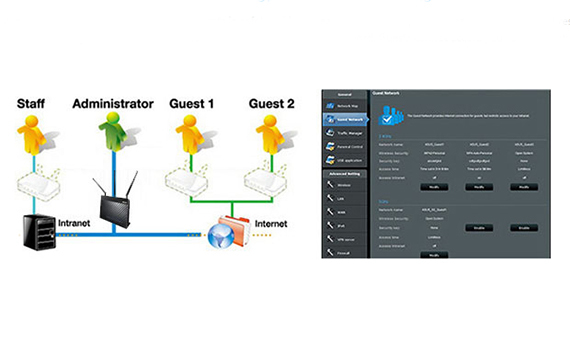 The General sections allows you access to the Network Map (a cool feature that gives you insight to the connected clients and it also allows you to interact with them), the Guest Network, the Traffic Manager (QoS), the Parental Controls (you can add a device to the managed list and setup a schedule for when the device can access the Internet; one problem is that you can’t control access to particular Web sites, so, this feature is pretty basic), the USB application and the AiCloud (allows you to share data stored on a PC within the network to remote clients, like Android or iOS users). 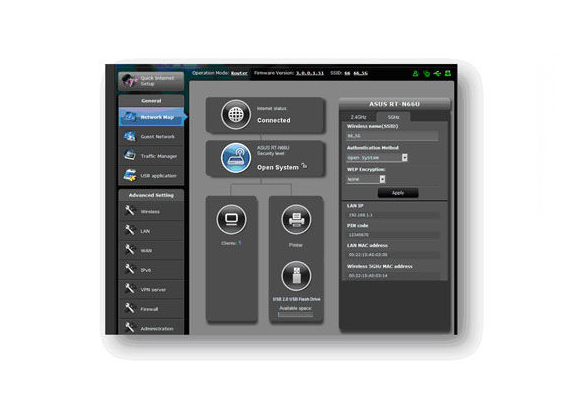 The Advanced settings get you access to the Wireless, LAN, WAN, IPv6, VPN server (create a secure virtual private network), Firewall (Dos Protection), Administration (Access Point mode and Media Bridge), System Logs and Network Tools. 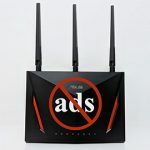 Overall, you get all the features you would expect from a high-end router and, as a bonus, you also get to access them using a clean, intuitive environment. The ASUS RT-AC68U has pretty much the same interface and the same features as the previous model, simply because it already was a great UI. You get the same Network Map, the same Parental Controls, the same QoS feature, a full built-in VPN server, AiDisk and AiCloud. 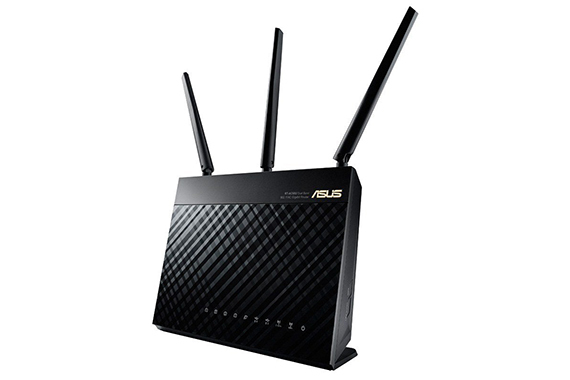 It’s clear that the ASUS RT-AC68U is the superior router, especially from a hardware point of view, but that doesn’t necessarily mean you will use all that power and its latest features. Still, when using VPN and QoS you will definitely see an improvement. 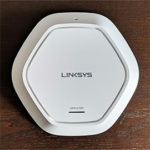 Both routers deliver stable WiFi signal, a great speed performance and good range, so it’s up to you if you consider it’s time to upgrade to a newer technology. If you decide to get your hands on the RT-AC68U, don’t toss away the RT-AC66U, instead use it in bridge mode, access point or as a wireless repeater.